“Crickets are the new kale,” says the Exo website, bringing to mind the trendy leafy green vegetable now found in everything from salads to smoothies. But when I think of eating crickets, I think of legs and wings and bug parts, not about eating them as often as people eat kale. I especially don’t think about eating them in a protein bar that, had it not been in a package clearly stating their presence, I never would have guessed one of the ingredients was crickets. 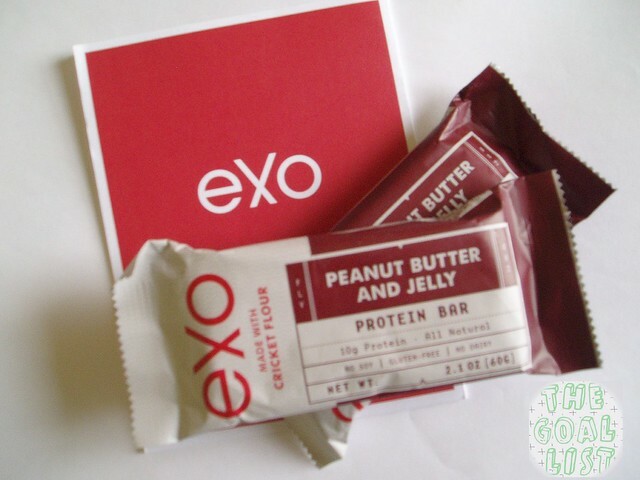 For this review I tried Exo’s Peanut Butter and Jelly bar*, which definitely had a strong peanut taste (as expected), and a tart “jelly” flavor from the strawberries. It didn’t taste exactly like a normal protein bar, since the taste was a little earthier/more pungent than I was expecting, but other than that, the taste and smell were pretty similar to other (lower-sugar) protein bars I’ve tried. However, since I haven’t yet tried crickets as a food on their own and don’t know what they taste like, I can’t say whether the earthiness was the taste of the crickets or was just unique to this bar. Since the crickets are ground up, there aren’t any obvious legs or antennae, and the shiny bits in the bar were from some partly ground flaxseed rather than the insect’s exoskeleton. The texture was a strange mix between mushy and dry/crumbly, so it was good that the chopped peanuts and puffed brown rice gave it a little crunch. If I hadn’t known ahead of time that there were crickets, I might have thought it was just a slightly odd-tasting bar, but what fun is that? Knowing is the adventurous part of the experience for those of us who don’t eat bugs daily. While I wouldn’t buy this bar for myself in the future, it was an interesting experience and might be worth buying as a gift for friends. It definitely doesn’t give you the social-media-friendly photo opportunity you get from eating whole bugs, but if you’re nervous about trying insects as food and would like to take a small step into the world of entomaphagy (humans who eat insects), the Exo bars could be a good opportunity for you. You can buy Exo bars online, but you can also get the free two-bar sample box (just pay shipping, USA addresses only). Have you eaten a prepared food product with insects in it? This entry was posted in Reviews and tagged crickets, eating insects, entomaphagy, Exo, product review on May 28, 2015 by Shelly Najjar.